If Potash Buys Agrium, Should You Sell Mosaic Stock? Mosaic stock went up yesterday, but it's coming back down today. Wouldn't you like to know why? Pretty soon, Potash (NYSE:POT) stock and Agrium (NYSE:AGU) stock could be one and the same. That's according to an article just out on Bloomberg yesterday, which reports that fertilizer producer Potash of Saskatchewan is in talks with Agrium about doing "a merger of equals." According to Bloomberg, such a combination would create a "combined company" controlling "more than 50 percent of North American potash capacity" (although some of those assets could be sold off to BHP Billiton or K+S AG to dodge antitrust concerns). Potash and Agrium investors cheered news of the potential merger, driving Potash stock up 11% in Tuesday trading, and Agrium stock up 7%. One company whose shareholders may not welcome the news, however, is Potash and Agrium rival Mosaic (NYSE:MOS). In a new downgrade just reported this morning on TheFly.com, Stamford, Connecticut-based Vertical Research Partners is warning that a Potash/Agrium merger could be bad news for Mosaic stock. Here are three things you need to know. Is there "gold" in them thar potash hills? Not all analysts think so. Image source: Getty Images. Downgrading Mosaic to sell, Vertical Research warns that it sees 24% downside to Mosaic's stock price if a Potash/Agrium merger comes to pass -- and that's 24% even after including returns from Mosaic's near-4% dividend yield. According to Vertical, Mosaic stock that sold for more than $30 yesterday could be worth as little as $22 a share if the merger happens. Vertical's conclusion today, by the way, is not the way investors were looking at the Potash/Agrium news as recently as yesterday. As Zacks Investment Research pointed out, Mosaic stock actually reacted positively to news of its rivals' merging, jumping nearly 9% on Wednesday. The reason? Zacks didn't speculate, but it seems obvious: If one fertilizer mining company is looking around for value in other fertilizer miners, the hope is that others in the industry might do likewise. And the more folks there are out there shopping for fertilizer companies, the more potential buyers there are for Mosaic stock -- a factor that in and of itself implies the stock price could go up. So why might all those people, who were buying Mosaic stock yesterday, be wrong? And why might Vertical Research be right? TheFly's write-up on Vertical isn't exactly clear on this point, saying only that Vertical thinks the merger of Potash and Agrium could "pressure Mosaic's domestic potash shipments." That could have (at least) two meanings. For example, a merged Potash and Agrium might be able to cut production costs and lower prices, undercutting Mosaic's pricing on the market, and hurting its profits. Alternatively, the merged companies' market dominance (again, we're talking about 50% market share here) could permit a merged Potash and Agrium to increase production and steal market share from Mosaic -- which would again tend to depress Mosaic's profits. And yet, there's a third scenario to consider as well -- and this one could work to Mosaic's benefit. Putting aside questions of whether there's now a "buyer's market" for fertilizer stocks in general, and whether that makes Mosaic stock more valuable, consider what might happen if a merged Potash and Agrium decide to act rationally after their combination. Spot Price data by YCharts. 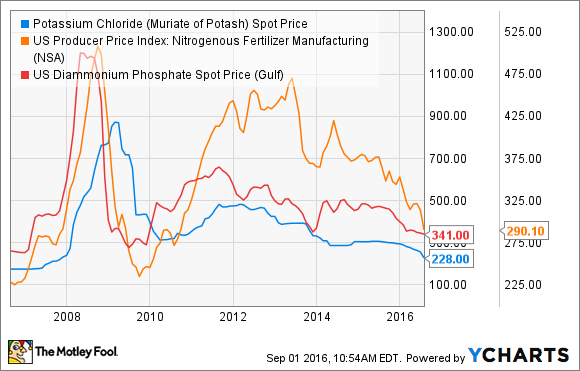 Currently, the prices of potash, nitrogen, and phosphate fertilizers are trading at multiyear lows. The market's quite simply awash in fertilizer, and for profits to revive, it would be nice if someone could cut back production a smidge, and return some supply-demand balance to the picture. And that kind of sounds like a job tailor-made for a company with "50% market share." The bull case for Mosaic stock, therefore, turns out to be very similar to the bull cases for Potash and Agrium: That a merger by two of these companies could result in production cuts that will benefit all three. That sounds like a good reason to start looking into buying stock in Potash and Agrium...and Mosaic as well.